An aspect of the decline of psychology (the new age turn within psychology) is personality typing. There exists several different kinds, and there are still coming more. Each new number of a New Age magazine with respect for itself, must include at least one new “revolutionary” theory of personality types, in the same way as it must present at least one new “revolutionary” spiritual theory “proved” by quantum physics (see my article Six common traits of New Age that distort spirituality). 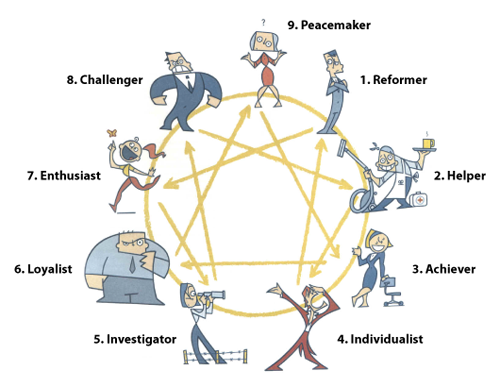 Both in New Age, and in coaching (Management theory), which claims to be purely neutral and scientific, the so-called Enneagram is very popular. It is a New Age mandala, a mystical gateway to personality typing, and through this to spiritual consciousness and fuller being. The enneagram represents nine personality types. It is original developed by Oscar Ichazo (b. 1931), who claims to have received it in a vision (see my article Paranormal phenomena seen in connection with channeling). Later the enneagram has turned up in several new versions, funny enough often developed by people, who also claim to have received it in divine visions. So how the types are defined depends on whom you ask. The classification systems seem to have been modified according to the inventors´ own idiosyncratic beliefs. Often they do it in relation to astrology. Such theories of personality types can point to many “successes.” They can demonstrate that their programs “work”. They can bring forth to testify on their behalf hundreds, if not thousands, of satisfied customers. But it is important to know, that testimonials do not validate a self-help program. Scientifical seen this is pure nonsense, and deeply manipulative. All talk about that testimonials are a proof, is a sign of pseudoscience (see my article The pseudoscience of New Age and reductionism). When looking at testimonials one must always consider the power of thought distortions such as, for example, Subjective validation, Selective thinking, Confirmation bias, Motivated reasoning, Classical conditioning and placebo effects, Proof by ignorance, etc., etc. We will end this article with an examination of Subjective validation. My professor in philosophy David Favrholdt once conducted an experiment with a large group of students. They were told that the experiment was about astrology, and that they each should have made a personal horoscope. The horocope for each student was then made by a professional astrologer, and when they received the horocope they were told to describe how precise it was. They all answered, that they were amazed how accurate the horoscope could tell about aspects of precisely their personal life. What they wasn´t told was that the horoscope for each student was the same, made after some typical astrological stereotypes. The experiement told about the power of wishful thinking and other thought distortions (see my book A dictionary of thought distortions). The same is the case with personality typing. People love such systems, and they wan´t to be seduced (see my article Some critical comments on astrology). Personality typing is a typical reductionistic view of human nature. Surely – many are the people, who become seduced by the reductionisms. Maybe not so strange after all: all reductionisms imply a simplification, a manageable solution to all problems, a key, which saves the supporters for having to think fundamentally over the philosophical questions – which after all only a few are capable to. But the human nature is far too complex to be characterized in this way (see my article The pseudoscience of reductionism and the problem of mind). A personality typing theory categorizes people in different psychological types. Such theories of psychological types are comparatively easy to invent, and earn money on, and they are certainly harmful because they involve all the problems of what I call The Hermeneutics of Supicion (see my article The Hermeneutics of suspicion (the thought police of the self-help industry) and why I am an apostle of loafing). There is no evidence for such type-theories at all. How do we test these kinds of claims? We cant. The philosopher Paul Ricoeur has referred to the “hermeneutics of suspicion” encouraged by writers such as Marx, Nietzsche and Freud. What people think, and the reasons they produce, may not be the real reasons at work. It then becomes easy to become suspicious of the motives of everyone, whether as the representative of an economic class, or the purveyor of a morality, or just as an individual with psychological problems to solve. And when a therapists or a coach - as it is the case most of the time - is lacking the ability of thinking deeper over things, then it ends in being a refined way of justifying prejudice. Personality typing is simply a way of creating a refined system of prejudice. And that is anti-scientific, anti-philosophical and anti-spiritual. Among many other thought distortions it involves the thought distortion called Representativeness bias. Many of our judgments involve classifying or categorizing individual persons or things. The Representativeness bias manifests itself when we take a few traits or characteristics of someone or something and fit them to a stereotype or model (again: see my book A dictionary of thought distortions). Prejudice is a belief held without good reason or consideration of the evidence for or against its being true. Philosophy - that is: rationality and critical thinking – is opposed to prejudice. And true spirituality is philosophy. We are all riddled with prejudices on a wide range of issues, but it is possible to eliminate some of them by making an effort to examine evidence and arguments on both sides of any question. Human reason is fallible, and most of us are strongly motivated to cling on to some beliefs even in the teeth of evidence against them (for instance wishful thinking); however, even making small inroads into prejudice can transform the world for the better. But theories of personality typing do the opposite. They try to remove rationality and critical thinking through the hermeneutic of suspicion. And they have succes. A whole time-tendency within school, folk high school, universities and continuing education, focus on so-called ”personal development and self-help”, which are inspired by them. Personality typing systems often make grandiose claims about that they are easy ways to get to know thyself, think for yourself and thereby be yourself. Actually the direct opposite happens if you in fact use them. You will end up in an existence-philosophical problem, where you in your opinion formation and identity formation strive after being something else than what you are (your type according to the system), where you imitate others (the types), are a slave of others´ ideas and ideals (the personality typing system), and where your actions are characterized by irresoluteness and doubt. Everytime you have a personal problem you will begin to think in the ways the personality typing system has taught you to think, and you will begin to consider if you ought to get help (use money) from a consultant in precisely this system. Notice that the new New Age typology system, The Human Design System, actually claims that statistical studies of various populations show the system to be reliable in grouping people according to four different basic types (see my article A critique of The Human Design System). Have The Human Design System not learned anything by studying the catastrophical human consequences of the Indian caste system, which precisely is about grouping people according to four different basic types? It is very important to understand that personality typing (an a variety of other New Age techniques and therapies, such as Neuro-linguistic Programming (NLP), Nonviolent Communication, Law of Attraction, Hypnotherapy, Astrology, Clairvoyance, Channeling, Human Design System, The Work, different healing methods, etc., etc.) can´t be understood, succeed, or work, without understanding the thought distortion called subjective validation. In other words: the effect will not go beyond the effects of subjective validation. Another important element in subjective validation is the natural human tendency to find meaning and significance. We will often give very liberal interpretations to vague, ambiguous, or inconsistent claims about ourselves in order to make sense out of the claims. In fact, we will often work hard to figure out some significance or meaning for statements that aren´t even about us when told that they´re somehow important. Mentalists and unscrupulous people claiming to be psychic take advantage of our desire to find meaning everywhere (see my article Paranormal phenomena seen in connection with clairvoyance). Also the though distortion called Clustering illusion can be a key to understanding subjective validation: the intuition that random events, statements, or items, which occur in clusters are not really random events, statements, or items. Personality typing - as most other New Age techniques - are dependent of that subjective validation is active in the client, or else it won´t work. Personality typing and subjective validation are two sides of the same coin. The role of subjective validation in the client is also the reason for why that there never has been, or ever will come, a successful scientific validation of personality typing.